Here are some of the incredible variety of French cookies that you should be sure to try if the occasion presents itself. You could of course try to make some of these yourself, but it is interesting to note that many mass manufactured cookies in France are made with surprisingly simple ingredients and are of a very high quality. 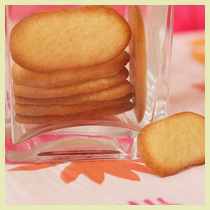 If you wish to skip right to making your own, see French cookie recipes. No discussion of French cookies would be complete without special mention to the LU cookie company. Their excellent quality cookies dominate the supermarket offering in France. Over 150 years ago, the LU cookie company was began in the western city of Nantes by the husband and wife team Jean-Romain Lefèvre and Pauline-Isabelle Utile (the first initials in their last names were combined to name the company). At first the company was mostly just a luxury store where people came to buy carefully crafted cookies, served with great show, and packaged for gift giving. 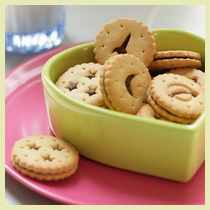 Over time and as the company's care was passed from one generation to the next, the company changed over to the industrialized production of cookies. Their marketing campaigns featured many delightful advertisements created by artists, and the le Petit Ecolier (Little School Boy) painted by Firmin Bouisset became emblematic for the LU company. In more recent times, the company has been bought up by Kraft Foods. The original emphasis on quality has never been sacrificed however. To this day, LU cookies are made only with ingredients you yourself might cook with. 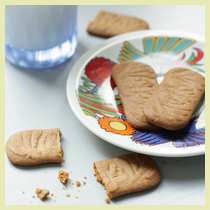 One of the first mass manufactured cookies made by LU, the shape of these butter biscuits is a fascinating study in efficiency. A petit beurre, or little butter, has a specific number of teeth on each side (14 by 10), has lovely little corners called ears, and are made so that 8 stacked cookies measure the width of one cookie. These are just a simple, not-to-sweet biscuit, good with a cup of tea. For many French children, this will be the first cookie they ever taste, and I suspect some mothers use them to calm teething babies. This is a petit beurre topped with a chocolate layer showing Bouisset's little school boy. LU (or shall I say Kraft?) markets these to a North American audience as a sophisticated tidbit, which makes me laugh, because in France they are heavily consumed as after school snacks. However they are marketed, these are very tasty French cookies. They come in at least four different versions: milk chocolate, dark chocolate, white chocolate, and hazelnut flavored chocolate. 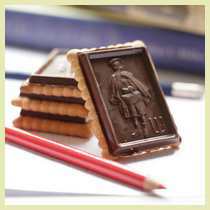 These are imitated by other cookie manufacturers, but the little school boy only appears on LU cookies. These French cookies come in three layers: a soft, genoise cake base, a jelly filling (popular flavors are orange, raspberry, and pear), and a dark chocolate topping. The three layers blend deliciously. These would make a lovely cookie to offer your girlfriends at an afternoon tea, but kids will scarf them up as well. These crunchy dark brown cookies originated in northern France and Belgium. They are flavored with spices (usually cinnamon) and are made with a special dark brown sugar called vergeoise brune. They come in a variety of shapes and sizes. 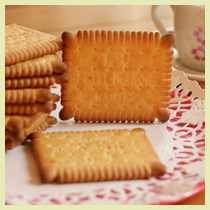 Speculoos are very sweet and are classically accompanied by a cup of good black coffee, but I think they go great with a glass of cold milk for dipping. America has its Oreo cookies and France has its Prince cookies. Prince cookies is the name given to these sandwich cookies by LU, but there are certainly other popular manufacturers in France. 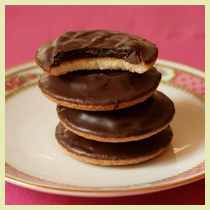 The cookie portion can be either vanilla or chocolate and the filling either vanilla, chocolate, or hazelnut. For me, this is a real kid cookie. They hold up well in backpacks, are not exceedingly sweet, and would go perfect with a glass of milk. These are small, thin, crispy French cookies. A simple cookie with a fun name (langue de chat means cat's tongue), sometimes these are dipped in chocolate for extra deliciousness. They might be flavored with lemon, orange or vanilla. If you serve these you could tell your guests about the French idiom, donner sa langue au chat (giving ones tongue to the cat), that you can use when you don't the answer to something. If you order a dish of ice cream in France it is likely to come with one of these served alongside. 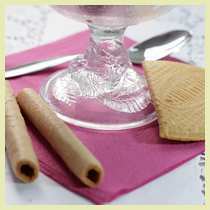 Their slightly sweet crunch makes the perfect accompaniement to a smooth cold treat. You'll also find cigarettes dipped in chocolate and even filled with cream. This means lace crepes and these cookies are actually very thin crepes that have been folded up, giving the cookie a layered crunchy texture. They were invented over 200 years ago by a certain Marie-Catherine Cornie who lived in Brittany and who developed a secret method for making the paper thin crepes, a method which was finally imitated by many others. To this day you can find artisans in France who specialize in making crepes dentelles. Tuile means tile in French and traditionally these cookies curve slightly making them look similar to the terra cotta tiles you will see on the roofs of homes in the south of France. Alas this bit of folly is lost when translated into industrial cookies, and the ones I can buy in the gorcery store are flat. 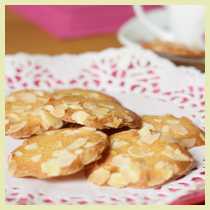 These buttery crisp French cookies are lovely at tea time but they would also go wonderfully with a fruit salad for dessert as well. Go from French cookies to French Foods.